Pinkster and JD agreed to that they wanted to get married in May or so, but didn’t actually get engaged until late July at a traditional Hindu engagement ceremony. Now, I’ve mentioned HERE how Pinkster and I know one another and a little background about her and JD. The ceremony and gathering for the engagement happened on a lovely Saturday in July, but it was the same week my Nana passed away and life was a little crazy. So while I made it to the day, it is all a bit of a blur. First, Pinkster grew up in the middle of Nowhere, Southeastern, USA. Her Dad is this awesome engineer and I guess there are a number of great companies in the area, but it is literally in the middle of nowhere. Not off an interstate at all. So I took over two hours worth of back roads, around the long side of the lake to get there. I passed cows, corn fields, goats in a front yard, skunk road kill, cows in ponds, soybean fields, chickens in front yards, cows napping under trees, signs for turkey shooting and businesses advertising the best taxidermy in the state to make it to her parent’s house. I may have gotten a little lost along the way, there were a lot of different roads! The whole thing started at 11am, I got there at 10:55am with everyone already gathered out in the front of the house. So they all see me pull up, looking a little harried. Pinkster told me later that as soon as I pulled up, her brother or someone saw me in my car, leaned over to her, and said ” Yep, she got lost.” Like I said, rough week, it was all a bit of a blur. Their immediate family and a few close friends were invited to the celebrate the day. When I got there about 30-40 people were gathered in front of the house taking photos, and I was immediately pulled into the group fun. After a few posed pictures with everyone, JD and Pinkster went into the front of the lawn, and in front of all of their family and friends, JD got down on one knee and asked Pinkster to be his wife with a GORGEOUS princess cut diamond ring. Pinkster and I had been talking the week before and she had joked she would say no, just to tease him. She didn’t (thank goodness). Instead she promptly burst into tears as she said yes. It was adorable. After a few more photos, we all went into the living room to complete the Hindu ceremony part of the day. It took a little over an hour, and I didn’t understand a single word of it, but it was so cool to see! There was a minister, that has some wonderful Indian title that I don’t know what it is, so we’re going with minister. He lead Pinkster, her parents, JD and JD’s mom through a whole process of passing fruit and such back and forth, repeating phrases in a language I don’t know in lovely prayer and exchanging flower leis. In the end he explained that Pinkster and JD were officially engaged and bound together. Her family has agreed to love, care and protect him and her family agreed to do the same with him. Following the ceremony we all went outside for more pictures and some yummy homemade seven layer sherbert cake (yum). Then there was a huge buffet of homemade Indian food. There was this homemade yogurt thing that I could have eaten a whole gallon of if they’d let me. A lot of people left after that, but some of the close friends had some time to catch up with Pinkster and JD. Her parents gave her a beautiful gold and ruby earring and necklace set that she then wore on her wedding day- I wish I had taken a photo because it was so gorgeous! The colors that all of her family were wearing were just so very beautiful. Oranges, blues, greens, pinks. 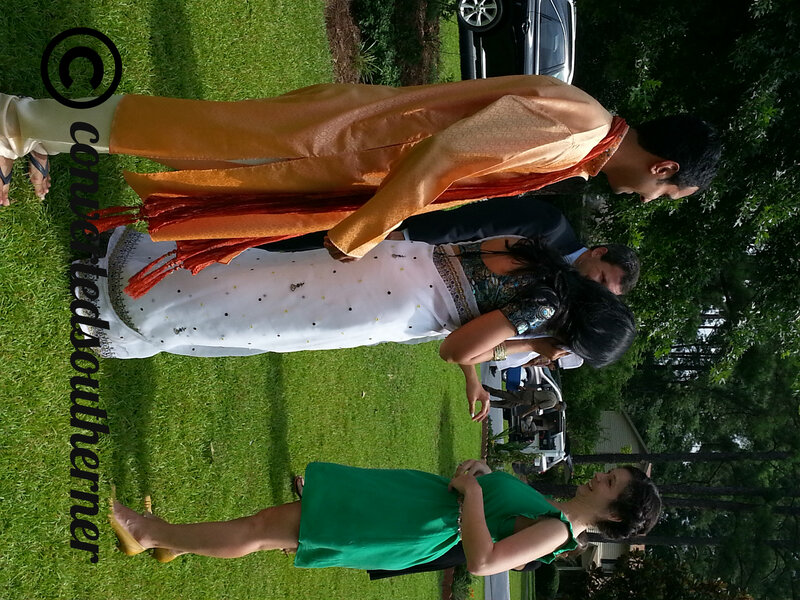 The saris were absolutely beautiful! I loved how everything in this ceremony, and then later in the wedding, symbolized something. It was so intentional and cool. I love her parents and want to adopt them. Sweetest people ever. Next time I blog about this I’m going to cover the pre-wedding activities!